Well, what a delinquent blogger I have been. The Harvatine Empire as a whole has been suffering this holiday season. The good news is all of the gifts have been given and now I can share! I plan to spread things out a little bit. I don't want to blow my wad in one post. To start things off, a frame for my good friend Niamh. This was modeled after a pattern in "Denyse Schmidt Quilts" but I didn't actually use the pattern. I really love Denyse Schmidt's fabric choices and combinations. They have such a random, haphazard look to them but there is a lot of thought and theory behind each piece. I have discovered this because when I try to imitate her style in a way that actually is random things never really come out very well. I like the fabrics that I used for this but I was strictly using what I had. My stash isn't quite big enough to totally emulate Denyse Schmidt but I try. 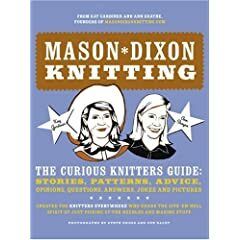 Niamh's gift to me was a copy of "Mason-Dixon Knitting" which I excitedly told her over lunch (before she gave it to me) Harv had given me for Christmas! I am sure she was disappointed but I think that it is just great. Here is why: Harv gave me the book because I had it on my Amazon wishlist. I put it on my wishlist because Niamh had been raving about it so I knew it must be good! And here comes Niamh, trying to share this great find with me and I have, in a way, beat her to it! I think it's very sweet. And I am very much enjoying the book.